The Meridian watch shows the time of day in several places at once. They are generally set to Greenwich time and then might be set to show the time in several cities such as Moscow, London and New York. 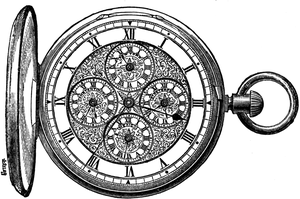 The meridian watch drawing I’m sharing with you comes from an 1875 book all about time and timepieces. Many of the great black and white timepiece drawings here on Reusable Art are from that book. It’s a shame that the book’s author and publishers weren’t able to reproduce better images of these watches. They must be absolutely stunning to see in real life.